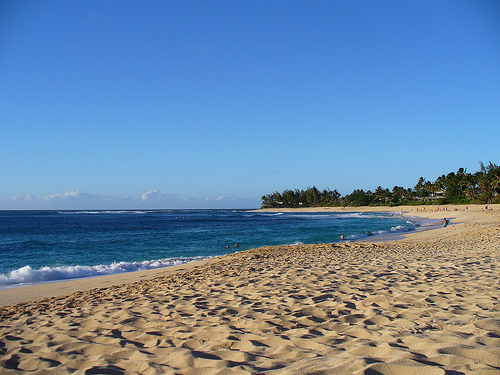 One of the longest sand beaches in Oahu running two miles in length and 200-300 feet wide. In the Summer when the ocean is calm, Sunset beach has crystal clear water and beautiful white sand. The area is great for swimming and snorkeling. There is also wonderful tide pools great for collecting shells and observing the wonders of nature. During the Winter months this beach is one of the best for surfing with waves often between fifteen and twenty feet high making it perfect for yearly international surfing competitions. 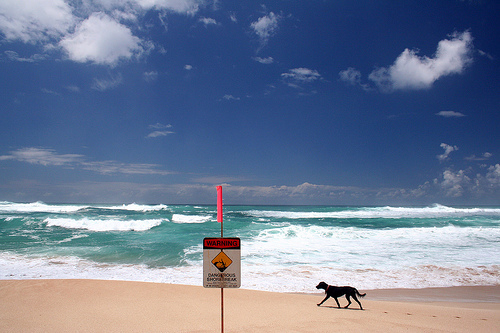 Sunset Beach OCEAN INFORMATION — For a detailed description of the Pacific Ocean’s marine climate, water properties, currents, tides, waves, etc., please visit The Ocean Atlas of Hawaii online. You’ll learn many interesting facts, like our average surface water temperature in Winter is 75 F (24 C) and 81 F (27 C)in the Summer.Call 596-SURF (that’s 596-7873) to hear a recorded message on conditions at various O`ahu beaches. The recording is a free service of the Surf News Network (SNN) and is updated four times a day, 365 days a year, at 7 a.m., noon, 3 p.m. and 7 p.m. In addition to wave heights, SNN provides information on winds, tides, and buoy readings.